If you only have 30 minutes before overage fees kick in, how on earth are you supposed to get somewhere that’s 35 minutes away? The 30-minute time limit applies only to 24-hour and 7-day pass holders. Annual members, the people with the blue keys, have a 45 minute limit, but many of them have asked a similar question. If your destination is farther away than time allows, aren’t late fees inevitable? Fear not, New York. There’s one trick that’s sure to become second nature in short order, like swiping a MetroCard or folding a slice of pizza. And to explain it, I asked Brian McEntee from the blog Tales from the Sharrows to write a guest post. 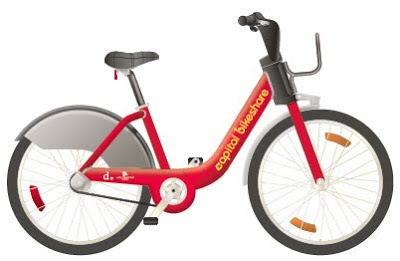 Brian writes about commuting by bike in Washington, D.C., and is a member of Capital Bikeshare. The Capital Bikeshare system in DC/Arlington/Alexandria is very diffuse. It’s over 12 miles between the southernmost stations in Old Town Alexandria and the northernmost stations in Petworth in NW DC. It’s a 14 mile ride from the westernmost stations in Arlington to the easternmost stations across the Anacostia river. How the hell is someone supposed to get a 45-pound bike 12 miles uphill in a half hour or less? (Even annual CaBi members only get 30 minutes.) Is Capital Bikeshare just trying to rip people off by making them accrue late fees with these long trips? It’s easy. It’s called dock-surfing. Others call it daisy chaining. It’s common practice in D.C., and the good news is that it works with Citi Bike, too. Need to get from 57th and Broadway to Fort Greene but all you have is a 24-hour pass and its 30-minute limit? With dock-surfing it’s easy to get there without paying a penny in late charges. Start your ride. Be sure to look at your watch or phone. Think about your end destination and whether you’ll be able to make it there in under a half hour. The bikes aren’t designed for speed, so be conservative. Think of some Citi Bike stations you might pass along the way. In fact, plan your route ahead of time with the intention of passing some intermediate stations. In the course of the ride from one end of the system to the other, you might pass one or two stations every few blocks. You can use the Citi Bike app or Spotcycle to get a sense of nearby stations. As your time limit approaches, ride up to one of these intermediates stations and dock your bike. Note the green light. At this point, your “trip” is over. As far as Citi Bike is concerned, your ride is done and your time is stopped. If you’re a 24-hour or 7-day pass member, you’ll need to leave the bike, swipe your credit card, get a new code and enter that code to release the bike again. If you’re an annual member, you don’t even need to leave your seat. Put your key in the slot, wait for the green light and remove the bike. It can even be the same bike, which means you don’t have to remove your bag. You’ll have to wait two minutes between docking a bike and taking one out again, but that’s the perfect amount of time to check your phone for directions or to see how many open docks there are at your next stop. Citi Bike considers this to be is a new trip and your time starts afresh. Go on your merry way, safe in the knowledge that you’ll reach your final destination well within your new time limit. Here’s the best thing about dock-surfing: you can string together as many intermediate stops as is your want. Just ride until you’re close to your time limit, dock the bike, undock the same bike or a new one, ride on, and repeat as necessary. So long as you know the stations along your route and keep an eye on your time, you’ll never incur any late charges. By adopting this very simple strategy, there’s never a need to rush and there’s never a need to pay extra if you’re just smart about it. Thanks, Brian! If you’re a bike-share pro from another city and have some insider tips about how to get the most out of the system, drop me a line at brooklynspoke at gmail dot com and I’ll feature your advice in a future post. Are people getting charged overage fees when the 45-minute point is passed while attempting to dock the bike? I’ve read that some users have been having difficulty with that, but I don’t know how true it is nor whether the system has anyway of detecting an attempted dock. If overage fees are waived for some time, couldn’t this be used as a way to gain extra time without even having to wait 2 minutes? We did exactly that in London recently, used the same bikes all day as we cruised around the city. Tal F: Apparently if you can’t find an open slot to dock your bike in, you can swipe your card to get yourself another 15 minutes to find another station. I haven’t tried it yet. In London, I did get billed an extra pound for returning a bike five minutes over the limit. Also, sadly, in London, you have to wait a full five minutes to take your bike back out, as opposed to two in NYC. Frustrating if you’re in a rush.